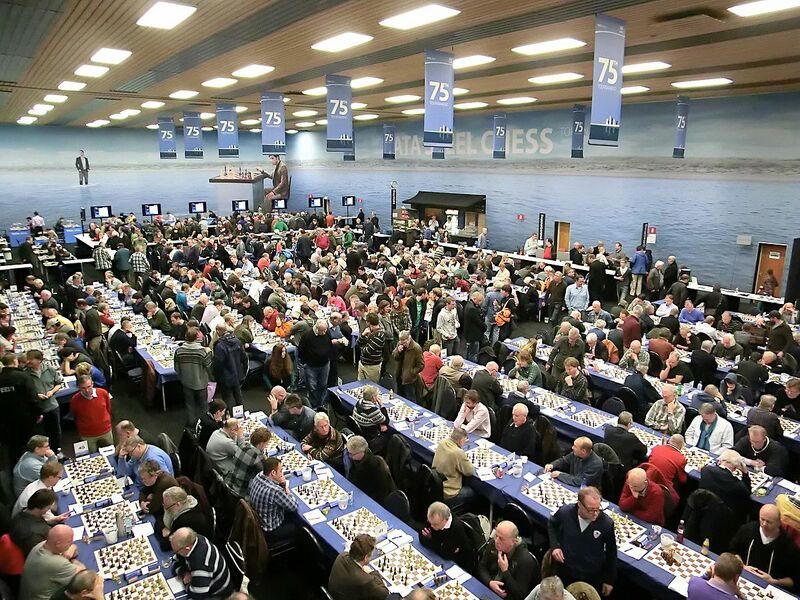 Welcome to my home town, Wijk aan Zee, and to the Tata Steel Chess Tournament, the biggest and best in the world. For those of you unfamiliar with Wijk, it is a coastal town about 44 km from Amsterdam and my English friends say it is a little like Broadstairs but with better chess players. At least, that is certainly the case at this time of year when players and spectators from all over Europoe descend upon our little town. Most of those are ‘amateurs’ but the main interest is on the 28 players who take part in the two main competitions, the Challengers and the Masters. We are constantly told that chess is a young person’s game and a glance at the entrants for both competitions will bear this out. You may be unfamiliar with the van Foreest family but they are well known in the Netherlands and GM Jorden van Foreest (19) plays in the Masters while his bother, Lucas, also a grandmaster at 17, plays in the Challengers. If you think that is young, the Challengers also features IM Vincent Keymer (14) and GM Rameshbabu Praggnanandhaa, who is not 14 until August! At the other end of the scale is GM Evgeny Bareev who at 53 is old enough to be their grandfather. All chess players know that it is no fun playing juniors so imagine how Bareev must have felt as he faced a young whippersnapper like van Foreest in Round 3. So what about the Masters, you may be asking. Well, it’s tight at the top and after eight rounds there is only half a point separating the leading five players. Ominously, after his run of 21 successive draws, Magnus Carlsen is beginning to strike form at the right time, winning three of his last four games to move into joint first place. We are pinning our hopes on Anish Giri, who plays Carlsen in the final round. In the meantime, let’s raise a cheer for the oldest player in the tournament, Vishy Anand, appearing at Wijk aan Zee for the 19th time. Vishy will be 50 this year yet he remains in the world top ten and currently shares the lead with Carlsen whom he plays in Round 10. Like Carlsen, he has won three games and drawn the rest but victories in his last two games suggest that momentum is with him. Anyone who can dispatch the world number three in 29 moves as Vishy did in Round 8 today cannot be discounted as a potential tournament winner. And what about the Game of the Tournament so far. Well, for many it is this swashbuckling effort from Teimour Radjabov in Round 7. After the game the two players discussed it at length and their analysis was recorded by organisers. Enthusiasts – the discussion went on for 35 minutes – can find it either on the Tata Steel site, Chess.com or YouTube.